Ruthiebear (Titusville, NJ, United States) on 20 March 2019 in Art & Design. A really cute sculpture. Lovely! Delightfully different ! I quite like it. Such an unusual subject. I guess you took pictures all round? Très sympa cette sculpture aux angles très marqués. Very crude and basic, Ruthie, but definitely something recognizable. Une très belle statue ! This sculpture makes me smile. Excellent look at this sculpture Ruthie. That's a cool sculpture, one that I can understand. An eye-catching sculpture spotted here! Une statue très épurée et fort originale. He’s stiff, but very likely likeable. A creative design. Not usuel. I like it. 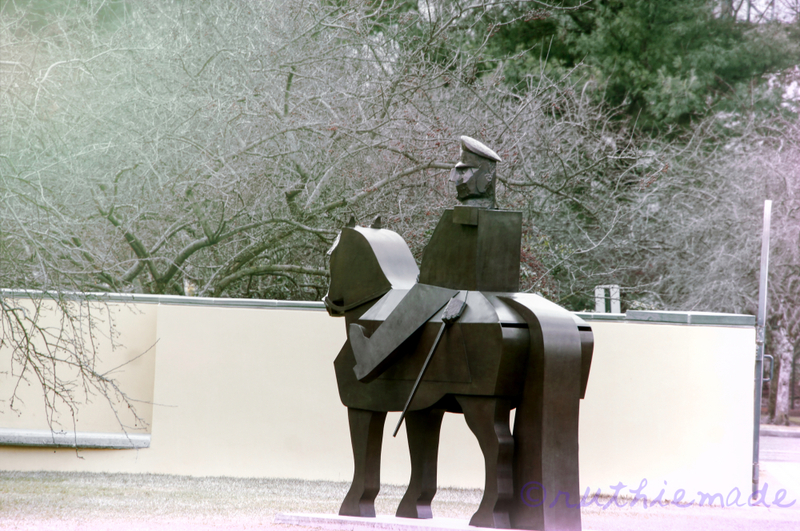 Who was the sculptor Ruth , i'd love to see more of their work ..
Quite an amazing sculpture of the cavalry officer. Superb composition with this surprising sculpture ! This is an interesting sculpture. It feels very powerful. I like how it was designed. A nice image. That's a very different sculpture, isn't it! Surprising this sculpture, modern but very pretty ! She is iron, or wood ? Oui, attention, il a l'air très sévère !